A leaking toilet tank is a messy annoyance that uses a lot of water. The unnecessary water usage and soaked floors will drive your water bill through the roof and drive you up a wall. Diagnosing and fixing a leaking toilet tank is not the easiest thing to do from those who aren’t professional plumbers. It takes a little know-how and a willingness to get your hands dirty, but after giving this article a read you’ll have your leaking toilet tank fixed up in no time. Inspect the leaking toilet tank for any cracks or deformities. If there is a leak coming from your tank, it is likely coming from one of the four holes that are made by design in the bottom of the tank (more on that latter), but if the tank is old and/or made of poor quality material there could be cracks in the porcelain that allows water to spill out. If the tank is compromised then you will need to completely replace the tank. Understand the four different holes in bottom of the tank. The tank-to-bowl bolts are the two bolts that are responsible for screwing the tank onto the toilet seat. The holes for these bolts are the two smaller holes that straddle the bigger hole directly in the middle of the bowl called the gasket. Under the Douglas valve is a rubber piece called the tank-to-bowl gasket. These connect the toilet tank to the toilet bowl. Basically what they’re responsible for is sending the waste from the bowl down the drain and filling the bowl with clean(er) water. This is the aforementioned hole that sits directly in the middle of the bottom of the tank. The valve is responsible for filling the tank with water after the toilet flushes. The hole for this valve resides in the back corner on the bottom of the tank. Look under your tank before disassembling it. You should be able to visually spot where the leak is spilling out from, easily identifying which hole is causing the problem. If not, feel around the leaking toilet tank for moisture. If it feels wet around a particular hole then wipe it dry, give it a couple more minutes and feel again. Then, if it is wet once again, then you’ve found your leak. Once you determine where the leak is coming from, prepare yourself for the proper repair. One of the most common leaking toilet tank problems stems from rotting and rusty tank-to-bowl bolts and gaskets. Being constantly exposed to water, the bolts and their washers wear away easily and give way to leakage. 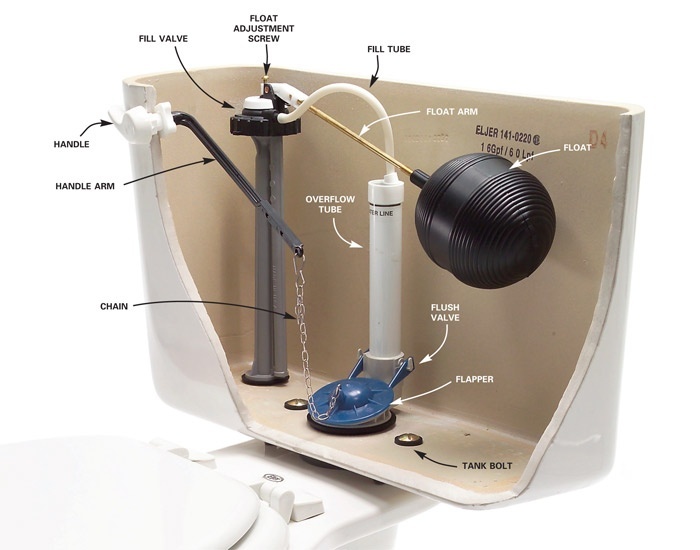 Buying a tank-to-bowl pack with a gasket, bolts, nuts, and washers and swapping out the old equipment with the new is probably the the most simple, effective, and most commonplace solutions to fixing a leaking toilet tank. This can be done by turning off the stop valve that extends from the base off the wall behind the toilet. 2. Drain the tank of any water. Pull the flush handle to flush the bowl and tank of any water. There will still be some water at the bottom of the tank. Wipe that up with a sponge. 3. Disassemble the tank-to-bowl bolts. Reach into the bowl with your adjustable wrench and loosen the nuts on the tank-to-bowl bolts that hold the tank down. Then on the other side of the tank, under the toilet, loosen the nuts on the other side of the bolts. 4. Remove the tank and set it on the toilet. While the tank is off you can inspect the gasket as well. If the bolts are rusted there’s a chance the gasket might be rusted too. Take a look at it. If it looks fresh then you can let it be, but it may be wise to switch the gasket and the bolts out together. It’s only one small extra step and gaskets already come in packs with the bolts included for not much more money. Doing both the gasket and the bolts together ensures that they will both be fresh and you won’t have to worry about fixing another leak in the toilet tank again a couple years down the road. 5. After you’ve discarded the old bolts, and potentially the gasket at your own discretion, clean around the holes on the bottom of the tank to remove any gunk or build up that may be surrounding the hole. 6. Apply the bolts back to the tank. Slide the tank-to-bowl bolts attached with rubber washers below the top of the bolt through the appropriate holes of the tank, then on the other side of the tank, slide a rubber washer followed by a metal washer up the bolt to sit on the bottom of the tank and secure it with a nut. 7. Place the new tank with the reassembled bolts back on the toilet seat. Line up the bolts with the matching holes in the toilet. 8. Slide a metal washer up the bolt until it touches the bottom of the toilet. Follow that by screwing a nut below the metal washer to secure it. When screwing the nuts onto the bolts you may need to jam your screwdriver into the top of the bolt on the inside of the toilet to hold it in place while screwing the nut from below it. 9. Turn the water back on. Flush the toilet to make it fill up with water. Once the tank is filled up with water look under the tank again and see if you can find any more leaks. If you’ve secured your bolts and gasket properly then the tank should be dry and your toilet should be fixed. A leak coming from the center hole of the bottom of the tank, which is where the gasket and the Douglas valve are located, will almost always be a result of an old, rusty gasket. If that is the case with your toilet, which it likely will be, then the fix will be the same as the one mentioned in the previous fix. Just go back to that explanation and review those steps to fix the appropriate leak. This page will be for the rare occasion in which the gasket leak is a result of not a bad gasket, but rather a broken Douglas valve. Replacing a Douglas valve takes a bit more skill, and should probably require the use of a professional plumber, but if you’re a handy DIY-er feel free to give it a shot! 1. So the job will basically follow the some of the same steps as the last fix. You’re going to want to shut off the water, drain the tank by flushing and using a sponge, disassemble the bolts, and remove the tank. 2. Once the tank is removed, strip off the rubber gasket. This will expose a locking nut under the tank that screws the Douglas valve into place. Go ahead and unscrew that nut. 3. Remove the freed up Douglas valve from the tank. Make sure that nothing is connected to the valve before you you try removing it. That means you should make sure that neither the chain from the flush handle is not hooked to the flapper, nor that the fill tube from the fill valve is inside of the old Douglas valve. 4. Place the new Douglas valve in the tank in an appropriate position so that it is close enough and angled properly to be reattached to the fill tube and flush chain. 5. Screw the nut back onto the bottom of the tank, effectively locking the new Douglas valve in place. Slide the rubber gasket back over the nut. Screwing the bolts back into the tank, setting the tank onto the bowl, and locking the tank onto the seat from below the bowl. Turn your water back on and inspect the tank for leaks. Another rather uncommon leaking toilet tank problem is a leak from the fill valve. If there is a leak spilling from the back corner of the tank, then something must be done about either the fill tube or the supply line. Before you try out any repairs, make sure the supply line from the wall to the tank is in good shape and secured properly. Unscrew the nut and readjust if necessary. If it is still leaking then you’ll likely have to replace your fill valve. 1. So this job is one that finally doesn’t require dismantling the toilet, but you will still have to follow the initial steps of shutting off the water to the tank and flushing it and mopping it with a sponge to drain it of water. 2. Disconnect the supply line from the bottom of the tank. Keep a bucket under the toilet handy during this step as water will spill out. 3. There will be a nut under the tank connecting the fill valve to the tank. Unscrew that using your hands or a pair of pliers. 4. Remove the loose fill valve from the tank. Make sure the ball float (the big rubber ball) and the fill tube (the plastic piece that connects the fill valve to the Douglas valve) are disassembled prior to this step. 5. Place the new fill valve in the tank. It should just enough space to fit right under the lid (about 0.5” below the top of the tank). So newer valves are adjustable so that you can pick the adequate height for your valve. If that is not the case for your replacement then saw wherever necessary to meet the appropriate fit. 6. Screw the nut below the toilet back in place to lock in the new fill valve. 7. Reconnect the supply line and turn the water supply back on, making sure everything is connected properly and there are no more leaks. If you’ve inspected your toilet and found that the porcelain itself is compromised and is the reason for the leaking toilet tank, then you’ll need to completely replace the tank. We advise that you don’t use band-aid quality remedies such as covering the crack with putty or epoxy. These are short-term fixes at best, and your toilet is eventually going to need a new tank at some point or another, so you might as well get it done as soon as possible. 1. This fix has some steps similar to the ones on the first job about replacing the bolts, just with the nuance of adding in an entire new tank to the toilet. Turn off the water, drain the tank of any water, and disassemble the tank-to-bowl bolts. 2. Lift up the cracked tank to remove it from the toilet and set it aside. You may want to salvage the bolts and gasket if they’re in good working condition, but the safest route may be to purchase a pack of a new gasket and bolts to replace along with the new tank. 3. Place the gasket onto the bottom of the new tank. Slide the round rubber piece over the hole in the very middle of the tank. You could use either a new gasket if you got a new one, or you could reuse the gasket from your old tank if it is in good shape. 4. Now, once again following the final steps from the first job, apply the bolts back to the tank, place the new tank with the reassembled bolts back on the toilet seat, slide a metal washer up the bolt until it touches the bottom of the toilet. Follow that by screwing a nut below the metal washer to secure it, and then turn the water back on. Flush the toilet to make it fill up with water. Once the tank is filled up with water, inspect it for any cracks in the porcelain. Since it is new it shouldn’t have any, although there could be damages caused in transit, and if you’ve opted to scrap up a older used tank the older porcelain could be compromised. Inspect the porcelain to make sure it’s solid, and also make sure you look at the holes and make sure the gasket and bolts were secured properly and there’s no leakage spilling out of it. If everything’s dry, your toilet is fixed! No more leaking toilet tank in your home.